Emotions, behaviors, thoughts, creations, planning, daily physical activities, and routines are programmed within our brains. To acquire these capacities, the brain takes time to fully develop--a process that may take the first 20 years of life. Disruptions of the brain involving neurons, axons, dendrites, synapses, neurotransmitters or brain infrastructure produce profound changes in development and functions of the one organ that makes us unique. To understand the functions and development of the brain is difficult enough, but to reverse the consequences of trauma and repair the damage is even more challenging. To meet this challenge and increase understanding, a host of disciplines working and communicating together are required. The International Association for the Study of Traumatic Brain Injury tried to correct this limitation during its meetings of international clinicians, researchers, and scientists from many fields. It was felt that many of the outstanding thoughts and ideas from the participants' most recent meeting and from others working in the field of traumatic brain injury (TBI) should be shared. 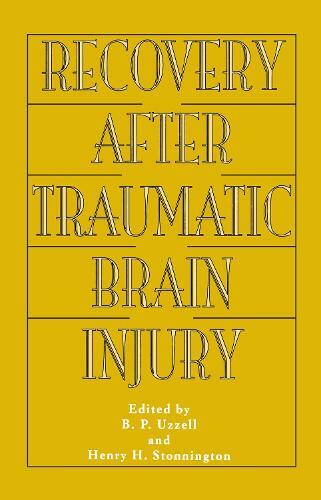 This book was conceived not as proceedings of the conference, but as a collection of knowledge for those working in the acute and chronic recovery aspects of head injury. This book reflects the importance of the team approach to patients with TBI. The chapter authors come from a diverse array of disciplines--basic science, neurosurgery, neurology, radiology, psychology, neuropsychology, and legal, consumer, and speech/language science. Their contributions provide the most current research and the latest ways of managing a variety of aspects of TBI.